Chronic obstructive pulmonary disease (COPD) affects 15-25 million Americans and over 300 million people around the world. The COPD Foundation is a global organization whose mission is to prevent and cure COPD and to improve the lives of all people affected by it. 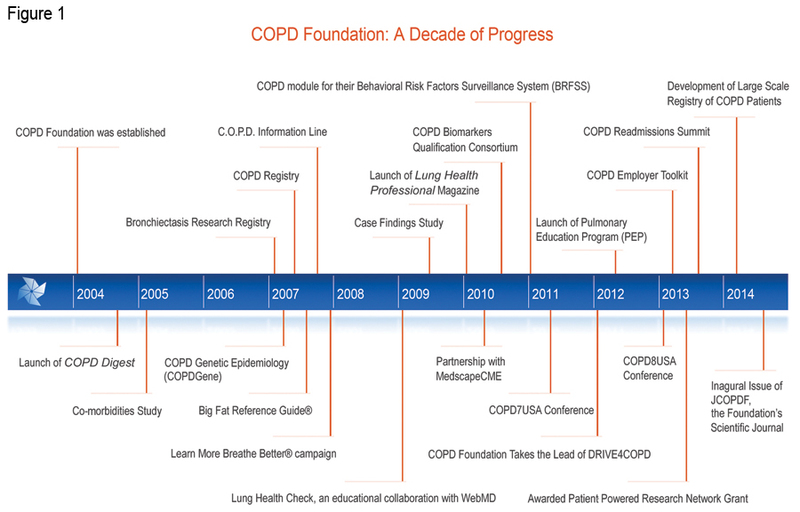 The year 2014 marks the 10th anniversary of the COPD Foundation. The Foundation works to accomplish its mission through a unique partnership between patients, patient families, health care providers, investigators, academic institutions, government agencies and industry. This partnership has led to real progress in awareness, advocacy, education, and research, but much more needs to be done. Date of acceptance: March 10, 2014. Abbreviations: National Institutes of Health, NIH; Slim Skinny Reference Guides, SSRG; Health Insurance Portability and Accountability Act, HIPAA; Airline Oxygen Council of America, AOCA; Centers for Medicare and Medicaid Services, CMS; Food and Drug Administration, FDA; Centers for Disease Control and Prevention, CDC; Behavioral Risk Factor Surveillance System, BRFSS; Mortality and Morbidity Weekly Report, MMWR; Global Initiative for chronic Obstructive Lung Disease, GOLD; American Thoracic Society, ATS; European Respiratory Society, ERS; National Institute for Health and Clinical Excellence, NICE; Lung Health Professional, LHP; Journal of COPD Foundation, JCOPDF; continuing medical education, CME; request for proposals, RFP; COPD Genetics Epidemiology, COPDGene®; high resolution computed tomography, HRCT; Subpopulation and InteRmediate Outcome Measures in COPD Study, SPIROMICS; COPD Biomarkers Qualification Consortium, CBQC; nontuberculosis mycobacteria, NTM; Patient-Centered Outcome Research Institute, PCORI; Patient-Powered Research Network, PPRN. A COPD Resource Needs Assessment Survey in 2004 queried over 1,000 patients, over 500 primary care physicians and over 500 pulmonologists.3 Among the physicians surveyed, 88% felt that COPD was a self-inflicted disease and more than one-third were nihilistic about the treatment of patients, particularly those who continued to smoke. Patients and physicians reported that insurance issues impeded access to therapies. Patients were generally uninformed about COPD and 50% of primary care physicians were unaware of existing COPD guidelines. Both patient and physician surveys demonstrated continued confusion about the diagnosis of COPD and treatment choices. 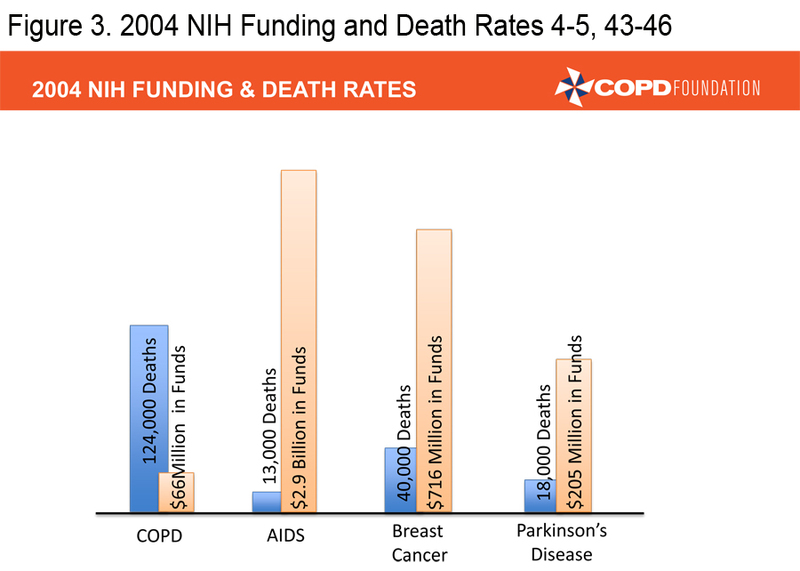 In 2004, the National Institutes of Health (NIH) funding for COPD research stood at $66 million compared to $205 million for Parkinson’s research, $716 million for breast cancer research, and $2.9 billion for AIDS research. 4-5 It was in this setting that the COPD Foundation was launched. The primary goal of the Foundation was to push for a broader, better funded research agenda, but Foundation leadership soon realized that there were too many gaps in COPD care to concentrate on a research agenda alone. Over the last 10 years the Foundation has concentrated not only on the need for increased research, but also on increasing awareness/ advocacy, education for patients, family members, and health care providers, providing patient assistance and a vehicle for the patient voice. The partnership between patients, patient families, health care providers, investigators, academic institutions, government agencies and industry has led to real progress but much more needs to be done. This manuscript will review some of the accomplishments of the Foundation in the 10 years of its existence. Established with the financial and organizational assistance of sister organization, the Alpha-1 Foundation, the COPD Foundation was created by a unique collaboration of individuals with COPD and scientific and clinical leadership in direct response to the scarcity of resources, education and information about the disease that left many patients, families and caregivers with nowhere to turn for help. 6 The COPD Foundation is a global organization whose mission is to prevent and cure COPD and to improve the lives of all people affected by it. The COPD Foundation is currently in the process of incorporating as a nonprofit organization (Fundación EPOC) in Spain. This incorporation will allow the Foundation to organize a greater global COPD initiative and establish a broader platform for more global COPD community collaboration to reach common goals in the fight against COPD. In 2014, the COPD Foundation was accredited by the National Health Council under its Standards of Excellence Certification Program for Voluntary Health Agencies. This is the highest quality measure that a health-related nonprofit organization can achieve. This booklet contains current information on COPD and spans topics including COPD diagnosis and management, anxiety and depression, exacerbations, and a list of COPD resources. The BFRG is a comprehensive publication that features in-depth explanations of COPD, nutrition tips, exercise demonstrations, device utilization and a wealth of information for the individual with COPD, care giver and family. The COPD Slim Skinny Reference Guides (SSRG) is a series of 10 chapters condensing specific information from the BFRG. The 10 chapters of the SSRG include issues related to COPD treatment and therapies, travel, exercise and oxygen therapy. In 2013, the Foundation added a new SSRG titled Hospitalizations and the Transition Back to Home. Also new in 2013 was the release of a Disaster Preparedness ToolKit (DPT) that was created as a direct result of the experiences and lessons learned from the devastation from Superstorm Sandy and Hurricane Katrina. This is an essential resource for individuals with COPD and health care providers on how best to prepare for disasters. In the past year, the COPD Foundation has translated these educational materials into 9 languages including: Arabic, Chinese, French, German, Hindi, Italian, Japanese, Portuguese and Spanish. Plans are in the works for multiple other translations. The COPD Digest was launched at the American Thoracic Society (ATS) Conference in 2004, as the first educational outreach initiative of the COPD Foundation. Published quarterly, the COPD Digest is the first free internationally distributed magazine on COPD and features COPD patient success stories and consumer savvy information, along with legislative updates, and Foundation program updates. The COPD Digest offers practical advice, news and information on treatment and resources to COPD patients, health care providers, families, and caregivers. As of 2014, there are 250,000 individuals receiving the COPD Digest in print and online. The Lung Health Check survey includes a variety of lung health and COPD- related questions and provides the user with educational reports tailored to his or her needs based on the answers that he or she provides. To date, more than 600,000 people have participated in this survey, including over 177,000 reporting a COPD diagnosis and over 318,000 reporting no COPD diagnosis but concerned that they may have COPD. As part of the collaboration between WebMD and the COPD Foundation, blinded data from Lung Health Check respondents was released to the Foundation for analysis and, ultimately, presentation at scientific meetings and publication in peer-reviewed literature. In 2007, the COPD Foundation established the Call Our Patients Direct (C.O.P.D.) Information Line to support the launch of the National Heart, Lung, and Blood Institute’s (NHLBI) Learn More Breathe Better Campaign to educate and spread awareness about COPD. The C.O.P.D. Information Line addressed the previously unmet need for patients and caregivers to speak with someone one-on-one who could provide assistance, empathy and support. The C.O.P.D. Information Line is staffed by Associates who must complete a rigorous 45-hour training program on customer service and call etiquette, service to sales, Health Insurance Portability and Accountability Act (HIPAA) compliance, health management information, COPD Foundation program information, and research initiatives. The Associates are comprised of individuals with COPD, caregivers or medical professionals from within the COPD community. The Information Line currently provides peer-to-peer support to those living with COPD and COPD caregivers in English, Spanish, French, and Italian as well as translation capabilities in over 175 languages. The Associates are required to continue training with a robust curriculum on relevant topics and information necessary to keep current and provide comprehensive resources to peers. In fiscal year 2013, the Information Line handled over 85,000 individual contacts that included telephone, email and live chat through the website. The average contact volume now totals more than 5,000 a month - more than 150 individuals reached daily. On January 18, 2007, the NHLBI launched a national awareness campaign targeting the 12 million undiagnosed individuals living in the United States with COPD. The goals of the COPD Learn More Breathe Better® Campaign are to increase awareness of COPD as a serious lung disease, increase understanding that it is treatable, and to encourage at-risk individuals to visit their doctors to take a simple breathing test and talk about treatment options. The COPD Foundation joined as one of the Campaign’s key partners from inception, and developed two dedicated programs to spread COPD awareness and support the Campaign: the Mobile Spirometry Unit and the C.O.P.D. Information Line. In 2007, the Foundation joined with the Alpha-1 Foundation to create the Airline Oxygen Council of America (AOCA). The AOCA led the initiative to challenge the restrictions of travel for those on supplemental oxygen and in 2009, AOCA efforts successfully advocated with several federal agencies to allow individuals to use portable oxygen concentrators on airlines. The Foundation continues to advocate for access to therapies and choice with the U.S. COPD Coalition and Congressional COPD Caucus and has established liaison relationships with the Centers for Medicare and Medicaid Services (CMS), the Food and Drug Administration (FDA) and the NIH. In 2009, the COPD Foundation began lobbying for COPD to be included on the Centers for Disease Control and Prevention’s (CDC) Behavioral Risk Factor Surveillance System (BRFSS), the world’s largest, on-going, telephone health survey. 10 The BRFSS is the primary data set used by health departments and public health organizations when prioritizing program activities and monetary resources as it details disease and behavioral issues down to the local level. The BRFSS data is reported by the states to the CDC which tracks national trends, identifies outliers, compares co-morbid conditions, and publishes results in the Mortality and Morbidity Weekly Report (MMWR). Despite the growing burden of COPD, the BRFSS had never included a core standard question regarding COPD prevalence. The space on each year’s BRFSS is highly coveted. Recognizing the need to include a core question about COPD, the COPD Foundation embarked on a comprehensive grassroots campaign. The COPD Foundation strongly believes in the power of the patient voice to influence change. Patient representatives in each congressional district, in a program called Operation 435, combined advocacy with an educational campaign to influence decision makers for the BFRSS, usually state health department officials. A core COPD question was added in 2011 and NHLBI made the funds available to states to implement an optional module that explored health care utilization. Data from the 2011 BRFSS was initially published in the CDC’s MMWR. The report, Chronic Obstructive Pulmonary Disease Among Adults—United States, 2011, indicated that over 15 million Americans, 6.3% of adults, have been diagnosed with COPD. 11 The prevalence rate varied from a low of 3.9% in Washington and Minnesota to a high of 9.3% in Kentucky. 11 The report further highlighted the severity of the COPD epidemic, but also confirmed the changing face of the disease--more women, more middle-aged, more never smokers (25% of those with COPD). In addition, for the first time the report suggested that COPD was a health care disparity issue: those making less than $25,000 a year are much more likely to carry a COPD diagnosis. In 2012, the COPD Foundation received the Aesculapius Award of Excellence for health-related television public service announcements, for its DRIVE4COPD campaign, the largest national public awareness campaign designed to increase public awareness of COPD ever launched. The Aesculapius Award of Excellence, awarded by the Health Improvement Institute, is designed to promote and to encourage excellence in the communication of good information about healthy lifestyles, disease prevention, and health care treatments. In this same year, the COPD Foundation assumed responsibility for DRIVE4COPD as a campaign of the COPD Foundation. Since the campaign’s inception in 2010, the Foundation partnered, with Boehringer- Ingelheim Pharmaceuticals Inc. and others on the DRIVE4COPD campaign. DRIVE4COPD has screened over 2.7 million individuals to date and has generated widespread awareness for COPD. DRIVE4COPD was named the “official health initiative of NASCAR®” and has extended awareness to NASCAR’s® extensive fan base and the Fortune 500 companies that comprise the NASCAR® sponsors. NASCAR® was selected as a target audience for DRIVE4COPD because NASCAR® fans are among the largest demographic of at risk for COPD individuals in the country. In fact, individuals with COPD are 30% more likely to be a NASCAR® fan than an individual that does not have COPD. 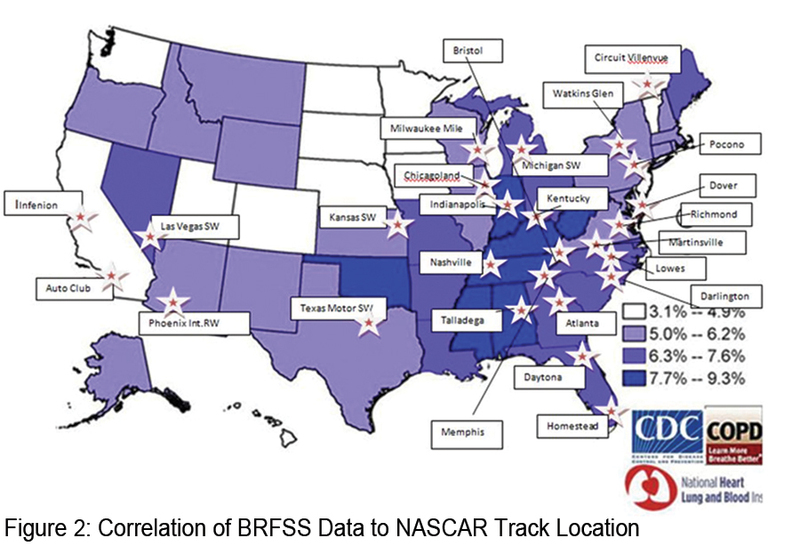 Figure 2 shows the states found to have the highest incidence of COPD and the location of the NASCAR® tracks. This overlap highlights the rationale to target NASCAR® fans through DRIVE4COPD. The Foundation has launched a free smart phone application (app) which allows the Pocket consultant to be used in an interactive format. The app can be downloaded from the i-Phone APP store by searching under COPD Foundation. The first version of the app listed the available generic medications, but subsequent versions will allow the user to toggle between brand and generic drug names, and a version with European medications listed is also being developed. An Android version is also being developed. Finally, recognizing the importance of making these tools as effective as possible in clinical practice, the Foundation has launched a social collaboration website for the Pocket Guide (pocketconsultantguide.copdfoundation.org) which is designed to provide a forum for health care providers to comment and make suggestions so that subsequent versions can be more effective. The Foundation has also released another free app allowing health care providers to teach appropriate inhaler techniques to patients. This app can be found at the APP store by searching under Use Inhaler. In 2010 the COPD Foundation launched the Lung Health Professional (LHP), a magazine designed for health care providers including primary care physicians, nurses, and respiratory and physical therapists. With a circulation of over 30,000, LHP covers a wide range of pulmonary issues beyond COPD, including editions on interstitial lung disease, pulmonary vascular disease, mycobacterial diseases, influenza and lung cancer. In 2011, The Journal of COPD became the official scientific journal of the COPD Foundation. In 2014, in response to the unmet request from the COPD scientific and physician community for an open access journal on COPD, the COPD Foundation launched its own open access journal titled Chronic Obstructive Pulmonary Diseases: Journal of the COPD Foundation (JCOPDF). Led by James Crapo,MD, Editor-in-chief, and an editorial board comprised of world leaders in COPD from across the globe, the JCOPDF (journal.copdfoundation.org) provides the COPD community with an outlet for high-quality articles that can be accessed quickly and easily. In 2009, the COPD Foundation established an accredited COPD Education Program ® designed for physicians, nurses, respiratory therapists and allied health professionals caring for individuals living with COPD. The Educator Course is an 8- hour course with 7 topics and a hands-on spirometry workshop. Upon completion of the course, individuals are certified by the COPD Foundation COPD Educator Program. In that same year, recognizing the importance of exercise and pulmonary rehabilitation, the COPD Foundation started the Pulmonary Education Program, which is geared towards supporting pulmonary rehabilitation clinics’ efforts to promote long-term benefits of rehabilitation by connecting patients to resources after graduation. In response to an Agency for Healthcare Research and Quality statement questioning the usefulness of spirometry, the COPD Foundation cosponsored a workshop with the NHLBI in June 2008. Out of that conference a three-stage approach was developed using a brief questionnaire, peak flow testing and diagnostic quality spirometry. Between June 2008 and December 2009 the COPD Foundation screened almost 6000 adults, mostly in health fairs around the country using the Mobile Spirometry Units. A major gap in the study was that peak flow testing could miss a significant percentage of individuals with milder disease, including potentially those with frequent exacerbations who might benefit from more aggressive therapy. Following completion of that study, the NHLBI released a request for proposals (RFP) with the aim to develop a validated, simple questionnaire including exacerbation questions and link it to peak flow testing in hope of developing a better way to determine who needs spirometry. That multi-institutional study (NHLBI R01 HL 114055, Design & Testing of Practical Tools to Identify Indivduals at High Risk for COPD), is well underway, is being led by Fernando Martinez, MD, David Mannino, MD, Nancy Leidy, MD, and involves five major academic centers and the COPD Foundation. COPD Genetic Epidemiology (COPDGene®) is an NHLBI-funded, multi-institutional study of past and current smokers to identify the genetic factors that control the development and progression of COPD and to facilitate development of specific therapies for the different subtypes of COPD. 26 The first 5-year phase of the COPDGene® Project created a cohort of over 10,000 smokers who are at risk for or express one of the various stages of COPD (GOLD grades 1-4). 15 This cohort was enrolled through 21 U.S. medical centers, and the participants were phenotyped using inspiratory and expiratory high-resolution computed tomography (HRCT). A genome-wide association study was done on the entire cohort and pilot whole exome sequencing was conducted. The overall hypothesis underlying COPDGene® is that extensive phenotypic and genetic data will enable creation of a new classification system for COPD, with distinct diagnostic, prognostic and therapeutic implications. COPDGene® has secured funding from the NIH for Phase 2 (2012-2017). The Foundation has partnered with COPDGene® investigators since the onset of the study, including sponsoring the initial investigator meeting. The Foundation organized an Industry Advisory Committee (IAC) to involve scientific representation from industry and provide ancillary support to complete the genome wide association studies (GWAS) and HRCT chest scanning on the entire cohort, fund the longitudinal follow-up, purchase equipment, commission the telephony platform and provide other items not funded in the original NHLBI grant. This collaboration created a new model of public-private engagement that the Foundation continues to utilize to advance its mission. The COPD Foundation continues to support the goals in Phase 2 of COPDGene®, including longitudinal follow -up. The SubPopulations and InteRmediate Outcome Measures In COPD Study (SPIROMICS) collects and analyzes multiple types of information, including blood tests and X-ray images of the lungs, from patients with COPD to identify subpopulations of COPD patients (groups of patients with similar symptoms, genes, physical signs of disease, etc.) and intermediate outcome measures. The study will also provide a better understanding of the natural course of COPD, and will allow scientists and clinicians to share data about COPD to improve other studies of the disease. SPIROMICS is funded by the NHLBI and is coordinated by the University of North Carolina at Chapel Hill. 27 The COPD Foundation is supportive of SPIROMICS and has been actively partnering with SPIROMICS investigators in study participant recruitment drives. Biomarkers are tests that can be used as end-points for clinical trials. There are different types of biomarkers, such as blood tests, breathing tests, radiologic (imaging of the lung) studies, exercise tests or quality of life measures. Despite the prevalence and impact of COPD, for years only a handful of biomarkers have been approved for use in clinical trials by the FDA: FEV1, mortality, and more recently COPD exacerbations. In 2010 the COPD Foundation was approached by the FDA and asked to hold a workshop bringing together academic clinical investigators and experts, government agencies, and the pharmaceutical industry, in hopes of addressing this research gap. The outcome of that workshop led the COPD Foundation to form the COPD Biomarkers Qualification Consortium (CBQC). This unique approach brought together interested parties from academia and industry to begin the process of sharing clinical trial data (and costs for data compilation and analysis). The CBQC has now submitted data to the FDA for one potential new biomarker - fibrinogen. In addition, the group is preparing summaries for 2 additional biomarkers – the St. George’s Respiratory Questionnaire and the 6-minute walk test. 28 The goal is to add to the limited set of currently approved biomarkers, and stimulate additional studies. A second biomarkers workshop held in early 2013 opened conversation on the next group of potential biomarkers to submit for FDA evaluation. Plans are also underway to work with European regulators in a similar approach. Bronchiectasis is a common finding in COPD patients and many with bronchiectasis have COPD. In 2007, in response to requests from the Key Opinion Leaders (KOL), the COPD Foundation, in collaboration with the NHLBI, convened a workshop to discuss the unmet need to support collaborative research and assist in the planning of multi-center clinical trials for the treatment of non-cystic fibrosis (CF) bronchiectasis. Based on recommendations from the workshop, the COPD Foundation, in 2008, with help of an initial donation from the family of Richard H. Scarborough, established the Bronchiectasis Research Consortium, a collaboration of the COPD Foundation and 14 academic medical centers from across the United States. The Consortium is charged with developing research priorities, establishing a research agenda, and, when funding allows, assisting in establishing a full grant program including a grant review and approval process. The Consortium established a Bronchiectasis Research Registry, a consolidated database of non-CF bronchiectasis. In 2012, in collaboration with Nontuberculosis Mycobacteria (NTM) Info and Research, Inc., the COPD Foundation expanded the Bronchiectasis Research Registry to enroll patients with nontuberculous mycobacteria (NTM) only. This expansion allows the facilitation of research on individuals with NTM with or without bronchiectasis. As of January 2014, there are 1,829 patients enrolled in the Registry, the largest non-CF bronchiectasis registry in the world. The Registry now includes longitudinal data of up to 3 years for many of those enrolled. Abstracts from consortium members have been presented at the ATS International Conference since 2010. In addition, the consortium plans to publish the first manuscript on the data in 2014. The cost of care for COPD in this country now stands at over $50 billion dollars a year. 29 Over 70% of that cost reflects exacerbations and over 90% of that 70% reflects hospitalizations for exacerbations. 30 Hospital readmissions have been singled out for improvement by the CMS National Strategy for Quality Improvement in Health Care. As part of the Affordable Care Act, CMS is aiming for a 20% reduction in 30-day readmissions potentially preventing 1.6 million hospitalizations and saving an estimated $15 billion. Combining financial incentives and penalties, the Affordable Care Act seeks to promote coordination across the continuum of care. 31 The first 3 core rehospitalization measures--acute myocardial infarction, congestive heart failure and pneumonia-- have been in place for several years. The 30-day, all cause readmission rate for those with an index admission of COPD has persistently been over 20%.32 COPD will be added as the next core measure starting fiscal year 2015. In October 2013, in Washington, DC, the COPD Foundation convened a COPD Readmissions Summit: Integrating COPD into Patient-Centered Hospital Readmission Reduction Programs to bring experts together, representing all the stakeholders of COPD, share best practices and develop a consensus on how best to address this issue moving forward. A workshop report is in development and the Foundation continues to make readmissions a priority. It is in the process of establishing a Readmission Collaboratory to capture and share best practices and continue the dialogue to improve health outcomes and reduce readmissions. The COPD Foundation remains committed to broadening a successful COPD research agenda--a research agenda aimed at defining and treating the different subtypes of COPD. All COPD is not the same, just as all cancer is not the same, and as with cancer therapy, COPD therapies need to be individualized. Two major hurdles slow research studies: cost and enrollment of appropriate study participants. In 2012, Forbes reported that the estimate for a major pharmaceutical company to develop a drug from discovery to market could cost at least $4 billion dollars. 37 An estimated 80% of total trials are delayed at least one month because of unfulfilled enrollment. 38 The COPD Foundation believes that a COPD Research Registry can help to reduce the burden of both cost and enrollment and ultimately provide a resource to speed clinical trials. Therefore, the COPD Foundation is committed to expanding the PPRN to develop the largest database of people with COPD and their medical information in the world. The technology platform to support this initiative will be a flexible and dynamic database structure that is being designed to accept data from a wide variety of sources. Individuals within the database will be characterized into relevant COPD subtypes as far as possible. Databases such as COPDGene® are being used to define characteristics of clinically relevant subtypes. This initiative will provide a critical recourse to speed recruitment for clinical studies, reduce cost and facilitate identification of individuals that meet the study eligibility criteria. The COPD Foundation recognizes the growing importance of an online presence and online social communication. Since 2009, the COPD Foundation website traffic has increased from 36,962 visitors in 2009 to 187,910 visitors in 2013. In 2013, Peter G. Goldschmidt, MD, DMS, president and founder of the Health Improvement Institute awarded the COPD Foundation the Aesculapius Award of Excellence for health-related websites for copdfoundation.org. The Aesculapius Award of Excellence is designed to promote and to encourage excellence in the communication of good information about healthy lifestyles, disease prevention, and health care treatments. In 2014, the Foundation plans to develop an online social community dedicated to COPD and seamlessly integrated with the COPD Foundation website. A social community for individuals affected by COPD, including patients, family members, caregivers and medical professionals, will provide a single, online home for these millions of individuals. In 2014, the COPD Foundation will continue to conduct patient and health care provider surveys, facilitate registration in research registries and clinical trials, and follow-up with patients to strengthen patient adherence and compliance with treatment. Surveys will identify constituent needs, while follow-up and feedback calls will provide the Foundation with invaluable insights into various gaps in COPD care and health management. The COPD Foundation will expand on the success of the Information Line and plans to staff a new outbound-calling clinicians’ component of the Information Line. Staffed by medical professionals, this expansion of the Information Line platform will provide a new resource to medical professionals. The Foundation will target calls to constituents to remind them and their family members to get critical immunizations such as those for seasonal influenza, pneumococcal, shingles, and pertussis. The COPD Foundation will partner with immunization clinics, retail drug stores and industry partners to enhance the success of this initiative. Plans for the expansion also include testing the success of an outbound calling program to reduce hospital readmissions of COPD patients. In addition, C.O.P.D. Information Line Associates will be utilized in the recently funded PCORI grant, Comparative Effectiveness of Peer-led Supplemental O2 Infoline for Patients and Caregivers and the Info Line will play a critical role in recruitment for the PPRN grant. The COPD Foundation has accomplished a tremendous amount in the first 10 years of its existence, but there is so much more that needs to be done. While awareness of COPD has increased, there are still numerous challenges to face. 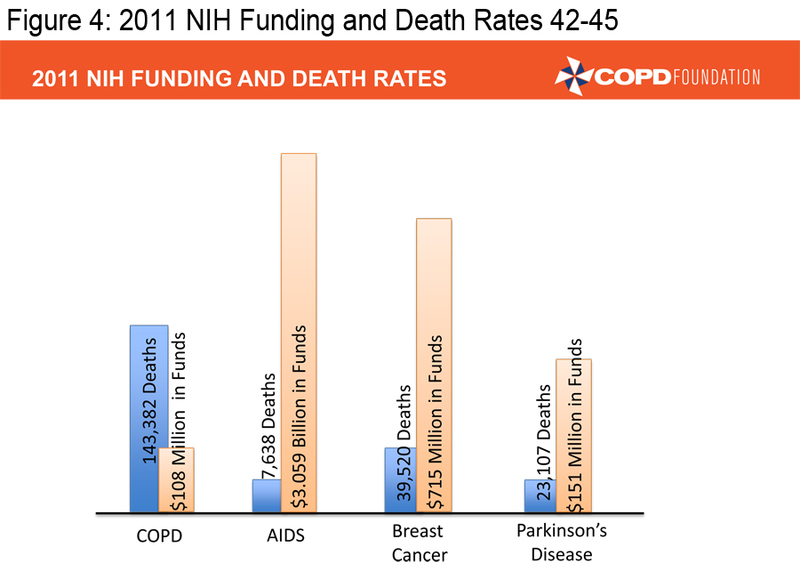 COPD is now the third leading cause of death39 and the second leading cause of disability in this country. 40 In 2009, two years after the launch of the Learn More Breathe Better® campaign, the largest COPD awareness campaign up until that time, the NIH reported that 68% of adults were aware of COPD, compared with 64%in 2008, and 49% in a 2004 survey. Among a high risk group, those who are currently smoking, awareness rose to 74% compared to 69% in 2008.41 Even with the continued efforts and success of large scale awareness campaigns like Learn More, Breathe Better® and DRIVE4COPD, we must increase efforts to find more of the 12 million suspected of having COPD but still not diagnosed. In order to achieve the mission of the COPD Foundation, we must ensure that those already diagnosed with COPD are appropriately diagnosed and that those appropriately diagnosed are receiving appropriate therapy. We also must facilitate research that can lead to better therapies. 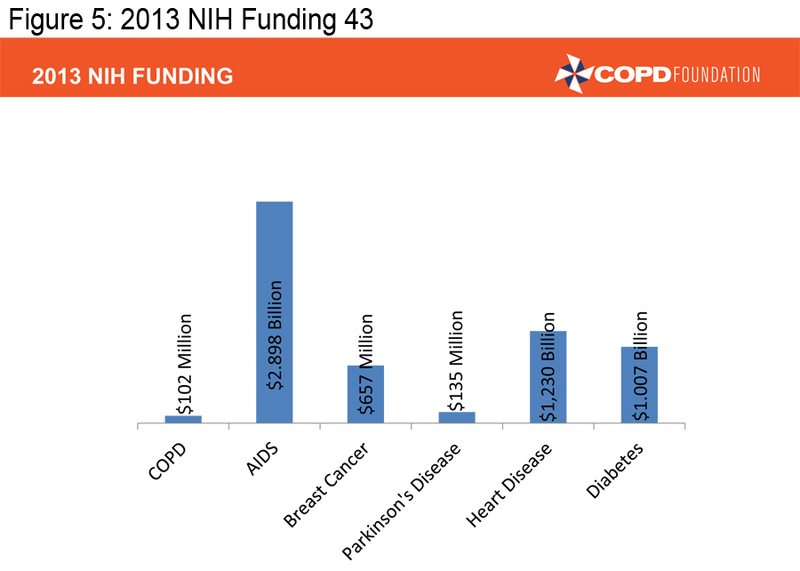 There too, we have made progress over the last decade, but COPD continues to receive only a fraction of the research dollars NIH provides for other major diseases. Our pharmaceutical colleagues have provided us with a number of excellent medications, far more than we had a decade ago, but we need to develop individualized therapies, therapies aimed at treating specific types of COPD-- targeted therapies. We must ensure that pulmonary rehabilitation, an underused resource, is much more available. Twenty to 30 million Americans, and 300 million plus around the world deserve a better future. They deserve to be able to breathe! We need better treatments, we need individualized, targeted therapies, and we need to find cures! That is our ultimate challenge. We will to continue to strive to inform, educate, empower and engage individuals with COPD to join with us and Take Action Today to Breathe Better Tomorrow. Together we can meet the challenges we face and create solutions by participating in improving our care and health outcomes, advocacy, research and awareness. All authors contributed to the concept, outline, and writing of the manuscript. All authors approved the final version of the manuscript. EDFM is Senior Director of Research for the COPD Foundation. JWW is President of the COPD Foundation. BMTis Chair of the Board of Directors for the COPD Foundation. The authors extend a special thanks to Delia Prieto of the COPD Foundation, and Vlady Rozenbaum, Ph.D. and the COPD-ALERT staff for their assistance and support in developing this manuscript and figures. 1. Mannino DM, Homa DM, Akinbami LJ, Ford ES, Redd SC. Chronic obstructive pulmonary disease surveillance-United States, 1971-2000. MMWR Surveill Summ. 2002:5 (6) 1-16. 2. Petty TL, Weinmann GG. Building a national strategy for the prevention and management of and research in chronic obstructive pulmonary disease. National Heart, Lung, and Blood Institute Workshop summary. JAMA.1997; 277(3): 246-253. doi: http://dx.doi.org/10.1001/jama.1997.03540270072029. 3. Barr RG, Celli BR, Martinez FJ, et al. Physician and patient perceptions in COPD: The COPD Resource Network Needs Assessment Survey. Am J Med. 2005; 118(12):1415.e9-1415.e17. 4. COPD-ALERT Support and Advocacy Group.COPD-ALERT fact sheet.COPD-ALERT Web site. http://www.copd-alert.com/CA-FACTN.pdf . Published October 2007. Accessed March 29, 2014. 5. American Association of Respiratory Care. Patient advocate Vlady Rozenbaum, PhD, shares his long journey with lung disease. AARC Times. 2007; 6-8. 6. Alpha-1 Foundation. About us. Alpha-1 Foundation Web site. http://alpha-1foundation.org/about-us/. Accessed March 29, 2014. 7. COPD Foundation. Educational materials. COPD Foundation Web site. http://www.copdfoundation.org/Learn-More/Educational-Materials/Downloads-Library.aspx. Accessed March 30, 2014. 8. WebMD. GFK Knowledge Panel WebMD Consumer Profile (2013) & comScore Media Matrix Multiplatform (January 2014).WebMD Web site. http://www.webmd.com/about-webmd-policies/about-what-we-do-for-our-users. Published February 2014. Accessed April 16, 2014. 9. COPD Foundation. COPD Foundation videos. COPD Foundation Web site. http://www.copdfoundation.org/Learn-More/Media-Galleries/COPD-Foundation-Videos/video/View/videoID/1/COPD-Discovery-COPD-Shuttle.aspx; COPDFoundation; Journey to the Center of the Lungs in the COPD Shuttle. Published September 16, 2010; Accessed March 28, 2014. 10. Centers for Disease Control and Prevention(CDC). Behavioral Risk Factor Surveillance System. CDC Web site. http://www.cdc.gov/brfss/about/ . Updated March 19, 2013. Accessed March 28, 2014. 11. CDC. Chronic obstructive pulmonary disease among adults—United States, 2011. MMWR. 2012;61(46):938-943. http://www.cdc.gov/mmwr/preview/mmwrhtml/mm6146a2.htm?s_cid=mm6146a2_w. Published November 23, 2012. Accessed March 17, 2014. 12. Truman, D. Ohio companies try to encourage employees not to take sick days. Knight Ridder Tribune Business News. November 2003:1. 13. Thornton Snider J, Romley JA, Wong KS, Zhang J, Eber M, Goldman DP. The disability burden of COPD. COPD. 2012. Aug; 9(5):513-521. doi: http://dx.doi.org/10.3109/15412555.2012.696159. 15. Vestbo J, Hurd SS, Agustí AG, et al. Global strategy for the diagnosis, management, and prevention of chronic obstructive pulmonary disease: GOLD executive summary. Am J Respir Crit Care Med. 2013;187(4):347-65. doi: http://dx.doi.org/10.1164/rccm.201204-0596PP. 16. B.R. Celli, W. MacNee, A. Agusti, et al. Standards for the diagnosis and treatment of patients with COPD: a summary of the ATS/ERS position paper; Eur Respir J. 2004; 23: 932–946. doi: http://dx.doi.org/10.1183/09031936.04.00014304. 19. Rennard S, Thomashow B, Crapo J, et al. Introducing the COPD Foundation Guide for Diagnosis and Management of COPD, Recommendations of the COPD Foundation. COPD. 2013; 10(3):378-389 doi: http://dx.doi.org/10.3109/15412555.2013.801309. 20. 1199SEIU United Healthcare Workers East. Home Page. 1199SEIU Web site. http://www.1199seiu.org/#sthash.nJCiMgTx.dpbs Accessed March 29, 2014. 21. COPD Foundation. COPD8USA conference. COPD9USA Conference Web site. www.copdconferencesusa.org . Published 2013. Accessed March 29, 2014. 22. Barr RG, Celli BR, Mannino DM, et al. Comorbidities, patient knowledge and disease management in a national sample of chronic obstructive pulmonary disease. Am J Med. 2009;122(4):348-355. doi: http://dx.doi.org/10.1016/j.amjmed.2008.09.042. 23. Salinas G, Wlliamson J, Kalhan R, et al. Barriers to adherence to chronic obstructive pulmonary disease guidelines by primary care physicians. Int J Chron Obstruct Pulmon Dis. 2011:6 171-179. doi: http://dx.doi.org/10.2147/COPD.S16396. 24. Qaseem A, Wilt TJ, Weinberger SE, et al; for the American College of Physicians, the American College of Chest Physicians, the American Thoracic Society, and the European Respiratory Society. Diagnosis and management of stable chronic obstructive pulmonary disease: A clinical practice guideline update from the American College of Physicians, American College of Chest Physicians, American Thoracic Society, and European Respiratory Society. Ann Intern Med. 2011;155(3):179-191. doi: http://dx.doi.org/10.7326/0003-4819-155-3-201108020-00008. 25. Nelson SB, LaVange LM, Nie Y, et al. Questionnaires and pocket spirometers provide an alternative approach for COPD screening in the general population. Chest. 2012; 142(2): 358-366. doi: http://dx.doi.org/10.1378/chest.11-1474 . 26. COPD Genetic Epidemiology. COPDGene® Study. COPDGene® Web site. http://www.copdgene.org/ Accessed March 29, 2014. 27. Collaborative Studies Coordinating Center, University of North Carolina-Chapel Hill Subpopulations and intermediate outcome measures in COPD study (SPIROMICS). SPIROMICS Web site. http://www.cscc.unc.edu/spir/about.php. Accessed March 29, 2014. 28. Jones PW, Quirk FH, Baveystock CM. The St George's Respiratory Questionnaire. Respir Med.1991; 85(suppl B):25-31. doi:http://dx.doi.org/10.1016/S0954-6111(06)80166-6 and http://dx.doi.org/10.1016/S0954-6111(06)80277-5 . 29. Foster TS, Miller JD, Marton JP, et al. Assessment of the economic burden of COPD in the U.S.: a review and synthesis of the literature. COPD. 2006; 3(4):211-218. doi: http://dx.doi.org/10.1080/15412550601009396. 30. Miravitlles M, Murio C, Guerrero T, Gisbert R; and DAFNE Study Group. . Pharmacoeconomic evaluation of acute exacerbations of chronic bronchitis and COPD. Chest. 2002 May;121(5):1449-1455. doi: http://dx.doi.org/10.1378/chest.121.5.1449. 31. Jenks SF. Defragmenting care. Ann Intern Med. 2010;153(11):757-758. doi: http://dx.doi.org/10.7326/0003-4819-153-11-201012070-00010. 32. Elixhouser A, Steiner C. Statistical brief #13: Readmissions to U.S. hospitals by diagnosis, 2010. Healthcare Cost and Utilization Project Web site. http://www.hcup-us.ahrq.gov/reports/statbriefs/sb153.jsp . Published April 19, 2013. Accessed March 17, 2014. 33. The Patient-Centered Outcomes Research Institute (PCORI).The COPD Patient-Powered Research Network. PCORI Web site. http://pfaawards.pcori.org/node/15/datavizwiz/detail/4748. Published 2013. Accessed March 29, 2014. 34. The Patient-Centered Outcomes Research Institute (PCORI). Comparative Effectiveness of Peer-Led Supplemental O2 Infoline for Patients and Caregivers (PELICAN). PCORI Web site. http://pfaawards.pcori.org/node/20/datavizwiz/detail/78916. Published 2013. Accessed March 29, 2014. 35. The Patient-Centered Outcomes Research Institute (PCORI). An Integrative Multilevel Study for Improving Patient-Centered Care Delivery among Patients with Chronic Obstructive Pulmonary Disease. PCORI Web site. http://pfaawards.pcori.org/node/20/datavizwiz/detail/79693. Published 2013. Accessed March 29, 2014. 36. The Patient-Centered Outcomes Research Institute (PCORI). PATient Navigator to rEduce Readmissions. PCORI Web site. (PArTNER) http://pfaawards.pcori.org/node/20/datavizwiz/detail/40669. Published 2013. Accessed March 29, 2014. 37. Herper M. The truly staggering cost of inventing new drugs, Forbes magazine. February 10, 2014. http://www.forbes.com/sites/matthewherper/2012/02/10/the-truly-staggering-cost-of-inventing-new-drugs/. Accessed March 29, 2014. 38. Lamberti, MJ. State of Clinical Trials Industry. Boston, MA: Thomson Centerwatch. 2006, 292. 39. Kochanek KD, Xu J, Murphy SL, et al. Deaths: final data for 2009. Nat Vital Stat Rep. 2011; 60(3): 1-117. 40. U.S Department of Health and Human Services. National Institutes of Health, National Heart, Lung and Blood Institute. COPD: It Has a Name, Speaker’s Guide. NIH publication No. 06-5842. NIH Web site. https://www.nhlbi.nih.gov/health/public/lung/copd/campaign-materials/pub/speakers-guide-with-pp-inserted.pdf. Published September 2006. Accessed April 27, 2014. 41. Survey: Awareness of COPD—The nation's fourth leading cause of death is rising but understanding is still low [news release].Bethesda, MD: NHLBI Communications Office; November 2, 2009. http://www.nhlbi.nih.gov/news/press-releases/2009/survey-awareness-of-copd-the-nations-fourth-leading-cause-of-death-is-rising-but-understanding-is-still-low.html. Accessed March 17, 2014. 42. National Cancer Institute. Surveillance, Epidemiology and End Results (SEER)Stat Fact Sheets: Breast Cancer. SEER Web site. http://seer.cancer.gov/statfacts/html/breast.html. Accessed March 29, 2014. 43. American Cancer Society. Breast Cancer facts and figures. American Cancer Society Web site. http://www.cancer.org/research/cancerfactsstatistics/breast-cancer-facts-figures Accessed March 29, 2014. 44. Hoyert DL, Xu J. Deaths: Preliminary data for 2011. Natl Vital Stat Report. 2012; 61(6): 1-52. 45. National Institutes of Health, Research Portfolio Online Reporting Tools. Estimates of funding for various research, condition and disease categories. NIH Web site. http://report.nih.gov/categorical_spending.aspx. Table Published: March 7, 2014. Accessed March 29, 2014.